"Saving changes is not permitted. The changes you have made require the following tables to be dropped and re-created. You have either made changes to a table that can't be re-created or enabled the option Prevent saving changes that require the table to be re-created." 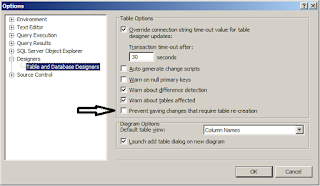 En SQL Server Management Studio, vamos a Tools -> Options, y en la pestaña Designers -> Table and Database Designers, desactivamos la opción Prevent saving changes that require table re-creation.